As much as I love peanut butter chocolate chip granola bars, I’m currently in love with something round and mini. More specifically, something round and mini that tastes like peanut butter and chocolate and pretzels all rolled up together in a cute little ball that can be devoured in two bites. 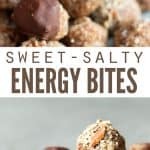 I like to call them sweet salty energy bites, and oh by the way, did I mention that they’re healthy? Healthy is a given around this space I call a REAL FOOD BLOG, but when you’re talking about chocolate and pretzels and even peanut butter, it warrants making the distinction. But these sweet salty energy bites are very healthy. So let’s make a bunch and snack on these instead, mkay? I confess: I didn’t reinvent the wheel in creating energy bites. 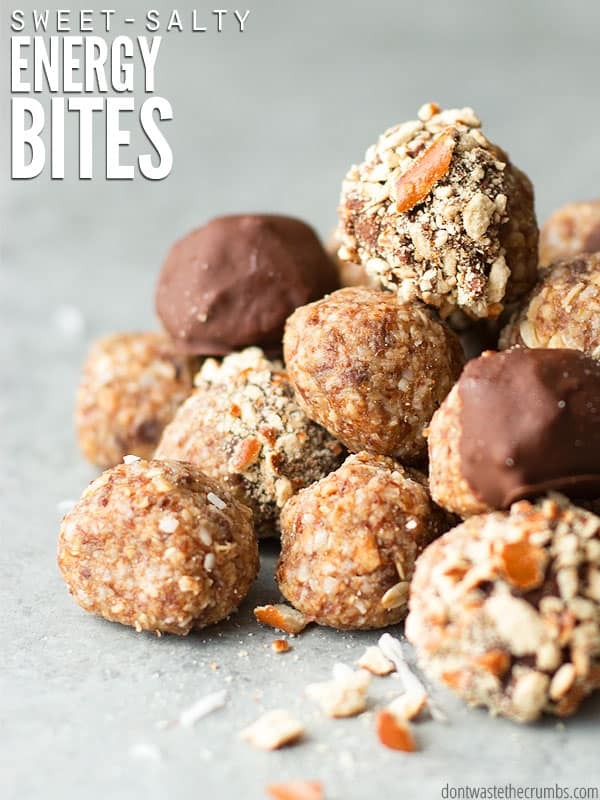 But I did make these the easiest, most addicting yet deliciously healthy energy bites you’ll find. For reasons only known to the inner core of my Type A brain, let’s break these ingredients down into two teams. First up, team wet. Coconut Oil. One of my favorite ingredients of all time thanks to its healthy profile. The fact that it’s solid at room temperature is worth noting too, which means these bites stay round and mini even after they’ve been in a lunch box all day. Honey. MPV of TEAM SWEET, honey just goes so well with everything else. It also plays a supporting role of energy bite glue. Peanut Butter. My preferred nut butter since it’s what I usually have on hand, but you can easily use any other nut or seed butter. Sweet salt energy bites don’t discriminate. Because energy bites made up of only Team Wet would be kinda… well, wet, meet Team Dry. Oats. Whatever kind you have will work because we’re going to whiz them up in the blender first anyway. (I use a Blendtec like this one.) Nothing like a big and chewy OAT sticking out in your energy bite to ruin the chocolate-y pretzel-y peanut butter-y moment. Coconut. Start with shredded if only to make your life easier because you are going to whiz these too. Unsweetened coconut is preferred since we’re adding honey, but if you only have sweetened in the pantry, go for it. Flax. An amazing super healthy super food that packs protein, fiber and healthy fat into these tiny balls of goodness (my favorite brand). When your eyes are closed and you’re savoring the salty sweet moment of bliss, only to pop your eyes open to wonder how in the world something so good could possibly be so good for you, remember the flax. Pretzels. Another star MVP here of TEAM SALT! Use whatever you have because (shocker) we’re using the blender. Me and my Blendtec are BESTBUDS and anytime I can use it to make cooking (a.k.a. my life) easier, I’m all over it. Chocolate. Entirely optional here, but it kicks the sweet up a notch and a must-do if you’re feeling indulgent. Use mini-chips IN the energy bites themselves or dunk the finished energy bites in chocolate. Either way, it’s chocolate. You can’t go wrong. Now here comes the magic. You can either mash it all up in a bowl with a spoon OR use your stand mixer. I’ve done it both ways and I personally like to use my stand mixer. It does a better job of mashing everything up together and really gets the dry ingredients coated with the wet. Plus I can turn it on and start cleaning up my mess while it mixes up. And for one reason or another, the ingredients tend to stay in the bowl when I use the mixer. There is more of Team Dry on the counter when I mix by hand. In either case, I also like to use a cookie scoop because Type A brain likes all the cute round energy bites to be the same size. And because a bunch of different size rounds on a pan isn’t quite as cute. Although they are awfully tasty. In a stand mixer (or a bowl), combine the coconut oil, honey and peanut butter until they are well combined and the mixture is smooth. In a blender (or food processor), measure out ½ cup of pretzels. Pulse until they are half crumbly and half small pieces, about 5-6 rounds. You basically don't want large chunks of pretzel, but you don't want teeny tiny crumbs either. Using the markings on the outside of the blender (or a measuring cup), measure out ½ cup of crushed pretzels. Repeat this process with more pretzels if you don't quite reach ½ cup. Add the pretzels to the bowl with Team Wet. 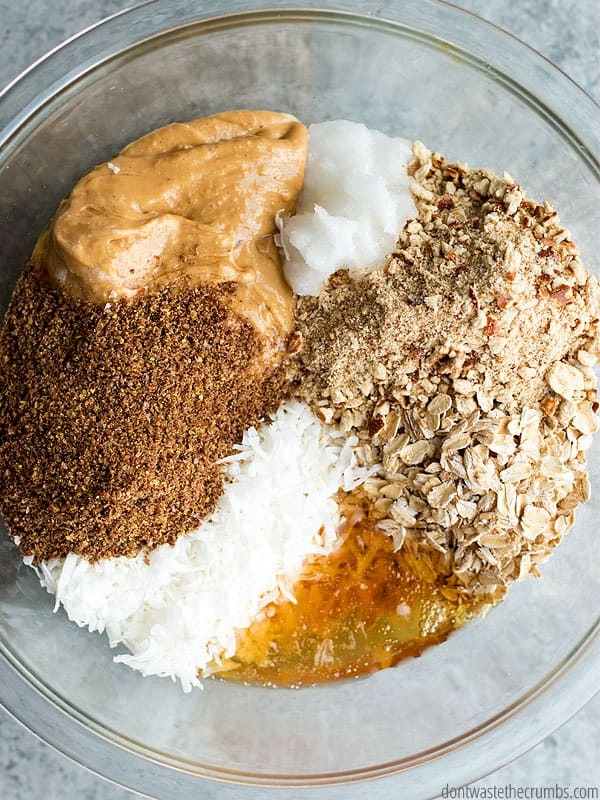 Without rinsing out the blender, add the oats, shredded coconut and flaxseed. Pulse until the oats and coconut are crumbled together in small pieces, about 5-6 rounds. Pour Team Dry into the stand mixer. Using the paddle attachment, turn the mixer on low and mix all the ingredients together until they are well combined and sticky. Using a cookie scoop, scoop out balls onto a cookie sheet. When the cookie sheet is full, pick up each ball with your hands, squish the contents together and shape into a ball. Place the ball back onto the cookie sheet and freeze for 30 minutes. Store in the fridge or freezer, although the freezer is preferred if you'll be packing these in lunches. For an extra indulgent treat (and to make the balls prettier), dip them in chocolate and roll in extra crushed pretzels. I’m loving the sweet salty energy bite combo right now – what would be your favorite energy bite flavor? Disclosure: This post is sponsored by Hodgson Mill. I’ve been using Hodgson Mill products in my kitchen for a long time now, and long before this blog was born. As always, I would never recommend anything on Crumbs that I wouldn’t recommend to a close friend or neighbor, and all opinions here are my own. Oh my, they look fab and the recipe sounds great. Can’t wait to try them. I have just discovered your blog and am loving it so much. Have a great day. I love the flavor of coconut; however, I despise the texture of shredded coconut. If I were to leave that out of the recipe, should I replace it with something else? If so, any suggestions? Thanks! I was going to ask the same thing! I’m not a coconut fan at all – there’s just something about the texture for me – so thanks for the other suggestions! Sounds delicious – and simple! Will be making with GF pretzels for my GF kiddo and me. Thank you! I made these today with nutella instead of peanut butter (my kids aren’t big fans of PB). They are delicious! Didn’t use any extra chocolate since the nutella is sweet already. Had some for after school snacks and kids have requested more for desert after dinner! Thanks for the recipe. Ooh, what a great substitution Karin! Thank you for the inspiration, and so glad your kids liked them!! YAY!!! I was hoping you would post this recipe after reading about it in your prep day post. Looks delicious!! Can you give the measurement of the flax seed? It says 1/2. Thanks! Oops! That’s 1/2 cup. I’ll fix that. Thanks Sarah! Tiffany, my mom in law made chocolate balls for Christmas for years, but she used confectionary sugar, crunchy peanut butter, butter, coconut, vanilla, rice krispies and of course, dipped them in chocolate. Can’t wait to try your recipe! I’m happy to have a healthy substitute for all the sugar which made up nearly half the dry ingredients. I think I’ve had those before Ruthie! They are good, but as you alluded to, they’re very sweet! I hope you enjoy these energy bites! Ooh – that sounds like a great combination Andreea! So glad you liked them! Ooo, this sounds reeaallly good! I have tried no-bake cookies before, but too much sugar. Think I’m gonna try this one! I think you’ll like these Robyn – they’re just sweet enough to hit the spot without feeling like you ate a sugar bomb! I don’t Sam, but you can use Calorie King to figure it out pretty quick. Enjoy the energy bites! 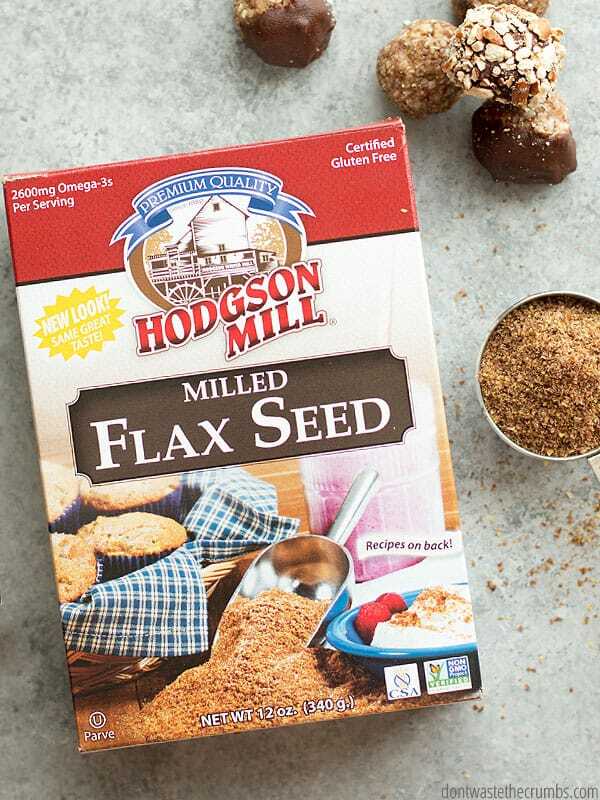 Can you replace milled flax seed with regular flax seeds? You can Shannon, but you might lose a bit of the binding factor. I haven’t tried this myself, so please let us know if you do this and how it turns out! Hello! Is there something else I can replace for the flax seeds? Only because I couldn’t find at the store unfortunately and would like to make these today! Hi Lori! You can substitute finely ground nuts, wheat germ, wheat bran or if you’re really in a pinch, ground up oats. You want a texture that’s similar to milled flax! Great recipe! Hubs can’t wait to try them! Hi! I made these today and used 1 cup of almond flour instead of the ground oats and they turned out really good! Thank you for such a nice recipe! Question, is “whole ground flaxseed meal” the same or similar to milled? It’s all I can find at my store. Yes Lori – it’s the same! Hi Letha! Unfortunately, I don’t. I’ve never heard of the 21 day fix before! Hi! These sound amazing, but I am allergic to cocount and cannot use the oil. I will try rice krispies to sub for the shredded coconut but do you have any suggestions for an oil substitute? Thanks! You can try subbing a nut butter Anne, but you’ll have to play with the measurements. Coconut oil is the glue, and it hardens when it gets cold. Start with a small amount, mix REALLY well, and then add more as necessary to get the right texture. Good luck! I’ve never had pretzels before or seen them in a store (I’m obviously not in the US) and amazon charges an arm and a leg to ship here (think $50 for a single small item). Do you have a recipe for them that you like or is it too hard to make from scratch? Soft pretzels are easy to make from scratch, but I’ve never tried hard ones before. You can substitute with something else – think coarse flour-texture, that’s a bit salty… like crackers. That should work! Thanks so much and I can’t wait to try these. Hi Susan! Since you’re taking oil out, you’d have to add oil in. In baking, you can add oil, applesauce and maybe even dates for fat/moisture content, so I’d start there for sure. 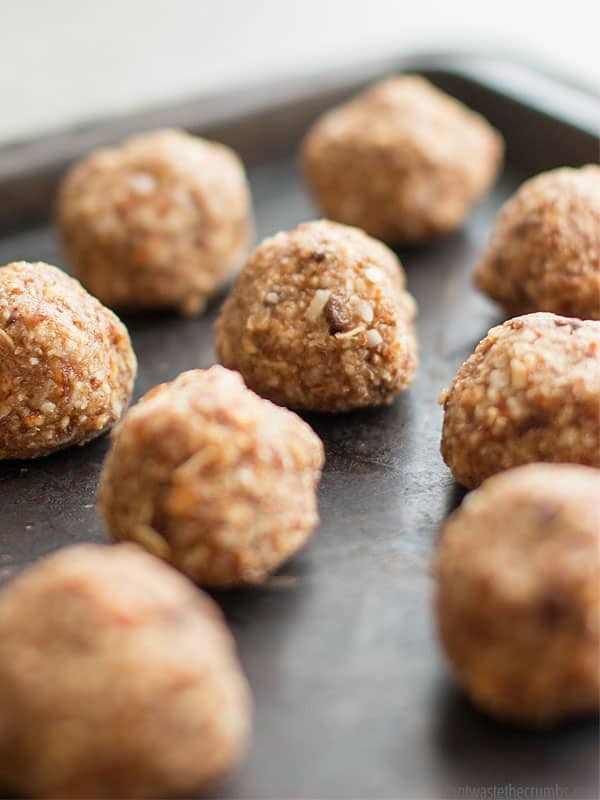 Applesauce won’t help keep them in ball-shape, but coconut oil and dates will! Great ideas, I didn’t even think about using dates. I was leaning toward using applesauce until I read your note about not keeping them in the ball shape so I think I will experiment with the dates. I will let you know how they turn out. Thanks again. Okay, so here’s the scoop. I purchased the prunes because I couldn’t find dates and when I got back home to make the energy bites I decided to make the recipe exactly as is first and I will now have to find another use for the dried prunes. These were so good that I can’t imagine changing one thing about them. So good with just the right flavors. Delicious! I put rough chopped dark chocolate chips in them. Would’ve used mini dark chips if I could find them. My small scoop died last year making 240 cookies for World Thinking Day for Girl Scouts, so I pressed the mixture in mini cupcake tins. And yes, like you, I like the scoop for making them all the same! Put the pans in the freezer for 5-10 min and they popped out easily. Do you think they would hold together at room temperature if they were baked for a bit? I didn’t want my flax seed or oatmeal as a powder, so I barely pulsed in the blender and I think I’ll skip that step next time. I like the texture they lend whole. Thanks for sharing. It’s a keeper. If I coated these in chocolate, you think they’d ship in a tin or mason jar ok for the holidays? Hmmm… maybe? I would think the chocolate would act like a protective barrier from “melting” or changing in shape. Typically mail isn’t climate controlled when you ship, and with the seasons getting cooler, it would work to your advantage. I’d say make a batch, cover a few and let them sit room temp overnight and see what happens. If they don’t change shape, I’d ship! Thanks for responding! One more question, do you typically dip them in the chocolate after the freezing for 30 min? 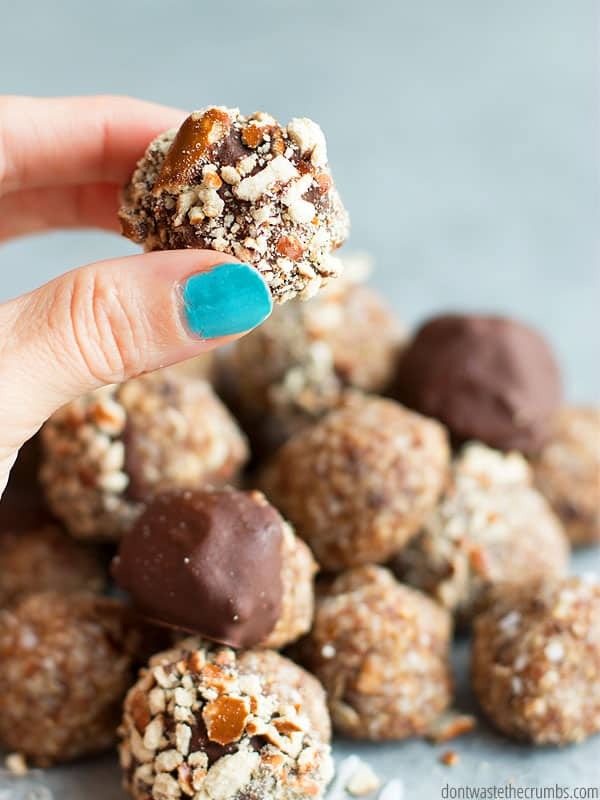 Or just before you pop them in…I’ve never made a ‘healthy’ version of no bake sweets ha! So I’m not sure how dipping them in the chocolate before freezing would work with the honey/coconut oil so easily liquified by heat…what do you do? Thanks so much! Have you ever thrown in some protein powder to boost the protein? If so (or not) can you recommend how? I Really wanted a healthier sweet to make and didnt have coconut or flax seed meal, but added a tbl spoon on chia seed and extra granola to make up for the absence of flaxseed. Not exactly ball shaped but soo good and the perfect combination of sweet and salty!